Correct and there should be NO TAX on food and medicines at all. One commodity was taxes at 28% and now tax rate is 18% , after hectic lobbying done by moneybags in those industries. And there are 100s of such cases. GST council decides rates, but it is Central Govt FinMin who has most of the powers. In addition to legal power, Central Govt also has tools like CBI to keep State Ministers to convince them to agree. The political realities are known to all. So now can Minister can earn political campaign funds by changing rates? Each voter of India can decide on his own. IOW, power to change rates imo is open invitation to rampant never ending corruption. (10) Small traders in GST cant do even Re 1 of exports or even interstate trading !! Say a trader is below is Rs 20 lakhs and so he wont register. He cant export services or sell goods by export or interstate at all. Not even re 1 !! So say a software maker who annual revenue is much below Rs 20 lakh decides to remain unregistered. And say by mistake he sells some services to US client and gets $1000 cheque in his own name and deposits it. He is now in big trouble !!! (actually happened with a friend of mine). Solution for him is to --- make two firms - one firm will do local business and another will do export etc. CA fees - at least Rs 10000 to Rs 20000 a year at least. But if by mistake he hasnt yet made two firms, and he has deposited software income foreign cheque in own account, then he may end up paying 18% on local revenue with fines (even if local revenue is below Rs 20 lakhs). Also, milk is GST-exempt, but cheese and butter have 5% (or 12%)? GST. But he is selling Rs 30 lakh of milk a year and selling Rs 2 lakhs of cheese / butter, then he first better get registeration, or butter will be bitter. And start filing all returns. And here, he doesnt have option of making two firms , unless he starts a firm in relative's name. So in GST, complex laws on exports and interstate trade, and mixed trade of GST-free goods and GST-applicable goods start applying even when business is just few lakh rupees a year. And hefty fines apply , even when money amount in question is small. (Right now, GST council has suspended all fines, but they will soon come). In contrast --- in income tax and wealth tax, complex laws applies on you ONLY after business grows. As long as business is small, laws that apply on business are simple in income tax and trivial in wealth tax. Now in year 2011, person will be in 20% bracket while in year 2012 and year 2013, only his top Rs 2 lak will attraxct tax of 30% . And in year 2013 and year 2014, he will be back in 20% tax. IOW income tax doesnt say that --- oh , you income crosses Rs 10 lakh, so now pay tax of 30% on whole income !!! And pay 30% rate on entire income next year !! Say revenue in year 2013 is Rs 22 lakhs again, GST will be 20% on WHOLE revenue = Rs 440,000 !!! Say income in year 2014 is Rs 18 lakhs again. He is below Rs 20 lakhs. But he has to pay GST of 20% on entire Rs 18 lakhs !!! = Rs 360,000 !! But in GST, tax rate on ENTIRE revenue next year shoots up due to even small cross-over in previous year. And so there is very high tendency in small traders to stay below the threshholds of Rs 20 lakhs and Rs 1 crore (for composite). And so they indulge into firm spllitting, use relative's names for second firm and so on. And all this increases complexiety and wastes away their time and energy. And there always a hanging sword of inquiry. So GST increases tendency to increase number of firms and under-report revenue for small unregistered / compoiste businesess. The tedency is there in income tax, but LESS. And it is less in wealth tax as well. The previous heading of this Financial Express 13-oct-2017, ahmedabad edition, page8 was Few informal units get formal ; Most die"
I have print copy with me !! Now the heading of the article on website is --- "Demonetisation, GST largely seen as positive development; here is why" !!! Few policies focus on what causes informality and so most ignore the cost of trying to make the economy more formal. Demonetisation, GST Glimpses of all of above can be observed in the almost one year after demonetisation and more recently, the GST reform. The move to formalise the Indian economy through demonetisation and goods and services tax (GST) system is largely viewed as a positive development. This is because an efficient and productive formal sector is perceived as the main driver of growth. Formalisation is understood happening through two shifts—informal to formal as unregulated firms enter mainstream, and market share expansion of formal firms as some informal businesses exit. These structural processes are accepted as given—no one really questions formalisation may not accelerate as anticipated. However, the cross-country evidence on reducing informality through explicit efforts is quite discouraging! Then too, scant policy attention has focused on what the costs of shrinking informality might be, if any offsetting measures are required to combat adverse income-employment effects. Scepticism and caution is urged on both counts: Expectations of formalisation and related growth benefits need tempering, while prudence is needed for recognising the additional costs imposed upon a segment that is already extremely inefficient segment and could tip over the edge without support. Two important insights are drawn from collated findings of La Porta and Shleifer (henceforth LPS) who consider the critical question of how the informal economy shrinks (“Informality and Development”, Journal of Economic Perspectives, 28-3, 2014). In sum, LPS conclude the informal sector rarely, if ever, transits to formal. The formal sector is essentially demand-driven, i.e. consumers’ preferences for high-quality, higher-priced products. Formalisation of an economy accompanies the level of development as the informal sector gradually dies out with rising per capita incomes. Now, this need not fully apply to India, but may do so in parts. Five critical facts about the informal economy that LPS distil from numerous studies and two decades of World Bank Enterprise Surveys imply this might be so. 1. Informal economy is huge in developing countries—a typical 30–40% share in total economic activity and high employment shares amongst the poorest countries in a 185-country sample; this share falls to 15-20% in the richest quartile countries. India is above the median share—455 of GVA originates from the unorganised sector. 2. Informal firms are small, unproductive, stagnant—but the main reason is not size, but human capital. For India, 89% of formal firms were headed by college-educated managers against none in informal ones as per Enterprise Survey data! Given a chance, many informal entrepreneurs would happily shut their businesses and work as formal sector employees, pay income tax. But few have this opportunity. The median productivity difference between informal and formal firms is 15%; for India, it is 18%. Similarly sized informal firms added just 21% of the value per employee of formal ones. Low productivity reflects very low quality products sold at low prices to low-income customers. 3. Regulation is not what keeps them down—lack of access to finance is the biggest obstacle; informal entrepreneurs lack skills, business and accounting systems that banks value. Land is another, partly because of illegal occupation and fear of eviction. Regulation, taxes are distant concerns, way below corruption, electricity, licence-permits and crime. Informal firms consider the biggest benefit of registering is financial access! 4. Informal firms rarely become formal—almost never. They start out and die in informality. They are not ‘reservoirs of entrepreneurial energy’ but ‘swamps of backwardness” (LPS). But they allow their owners to survive. Majority of registered firms started off as registered. A small percentage of informal firms, 14%, sell their output to formal firms (Enterprise Survey). 5. As countries develop, informality becomes less important—the informal economy, captured by the degree of self-employment shrinks as per capita income rises. It is intuitive seeing the association between consumer incomes and demand for better quality, higher priced goods produced by the modern, organised sector. The above basic facts suffice to inform that framing concerns about informal activities entirely in terms of negative consequences for competitiveness and growth and fiscal losses from undeclared economic activity is one-sided. Both demand and supply matter: low incomes and low demand for modern goods and services; job opportunities relative to the supply of unskilled labour force, education and managerial skills of entrepreneurs, etc. It is for governments to work out what matters how much, especially before structural policies are drafted to hasten formalisation to spur productivity and growth. Joining the formal sector significantly raises costs for informal firms—far more than they can recoup from raising volumes and prices given market constraints or which they can’t dream of lowering with their existing managerial skills, inputs, etc. Glimpses of all of above can be observed in the almost one year after demonetisation and more recently, the GST reform. Scattered reports abound about small business closures and failures, import substitution, rising default rates of small finance banks, rising unemployment, farmers’ unrests, and much more. The inability to adapt is variously manifest in either strong resistance or pleas for fiscal support, e.g., reversion to cash from digital transactions (costs, computer knowledge and access, etc. ), online compliance aversion under GST by textile, construction, transport, trade and other segments marked by large informality (lack of managerial, IT skills, accounting systems, additional costs threatening viability, loss of business from formal buyers, etc). There is likely much more that remains hidden or uncovered and unknown. In December 2016, we speculated if demonetisation’s debilitating impact could open fault lines for a (goo.gl/sqnS8N) structural slowdown, arguing for a quick survey to assess damages to the informal economy. Much water has flown under the bridge since. But now, the institution of GST reform so closely after demonetisation, the facts and evidence on why the informal sector is what it is and how it shrinks, the surfacing responses juxtaposed with India’s own structural characteristics call for focusing upon the constraints on transition to formality that are more to do with supply side factors than mere evasion of taxes and regulation. As LPS note, recognising that informal firms are extremely inefficient, extreme caution with policies that impose on them any kind of additional costs is recommended. It is overlooked that most other GST countries had much smaller informal sectors, e.g., 10-12% in Malaysia and lower informal employment shares, e.g., 33% in China as per ILO against India’s 82%. The focus upon formalisation not only misses supply-side constraints to transition but also fails to incorporate safety nets for those who could be casualties in the process. We can only finish with LPS who find evidence is consistent that informality declines, although slowly, with development. Therefore, structural policies designed to promote formality should be introduced with caution; their wisdom depends in part, whether they encourage formalisation, or discourage informal activity. They are sceptical of all policies that might tax or regulate informal firms; rather than encourage them to become formal, these could instead drive them out of business, leading to poverty and destitution of informal workers and entrepreneurs—despite all their benefits of avoiding taxes and regulations, they simply cannot compete with formal firms. Growth that kills the informal sector is driven by the formation and expansion of formal firms managed by educated entrepreneurs. Taking into account the subsistence dimension of informality in India suggests a combination of following outcomes: fierce resistance to formalisation for preserving livelihoods, which would only thwart formalisation; or substantial income and employment losses surfacing as a drop in aggregate demand. Possibly, a mix of both. Perhaps expectations of accelerated formalisation need moderation, especially in the light of steadily decelerating growth. The prism of viewing the informal sector as merely unproductive and tax-evading needs broadening too with greater attention to the bottleneck—the supply of educated entrepreneurs who can run productive businesses—and mitigating the costs. While it is early days, and companies are still grappling with the GST, the relatively low number of returns filed for July is disappointing. Of the approximately 60 lakh assessees who were supposed to file GSTR1 (sales) returns by October 10, only 46 lakh have done so. Even after accounting for some 2 lakh incomplete filings, as also those who would opt for the composition scheme or are B2C players, the gap would appear to be fairly high at close to 10 lakh assessees. Equally perplexing was the relatively high number of assessees who claimed their tax liability was nil in the returns filed by August 20. Of the 56 lakh summary returns that were filed, 40% or 22 lakh assessees claimed they were not eligible to pay any tax at all. Conceding this was a very big chunk of assessees, the government has decided to launch a survey to figure out whether this is genuine. There will be no searches or seizures; instead, the government hopes to get some information through consultations with taxpayers and other sources. Prima facie, it seems highly unlikely such a large number of firms attract no tax liability. Either way, it is important to get to the bottom of this to get a sense of whether the tax base is actually expanding. Given 26 lakh new taxpayers have come into the tax net, the GST collections should have seen much greater buoyancy. Possibly, the system will stabilise over the next few months and this will lead to a bigger mop-up in subsequent months. As of now, though, the mobilisation is subdued and there has been a shortfall in both July and August. Unless all glitches are ironed out in the next few months, the government could be staring at a shortfall in indirect tax collections vis-a-vis the budget estimate of `9.27 lakh crore for FY18. While teething troubles were always to be expected in the case of GST, what is surprising is that even after demonetisation and the Operation Clean Money initiative, there doesn’t seem to be any exceptional buoyancy in direct tax collections either. Direct tax collections have risen 15.8% y-o-y in H1FY18 versus 8% in H1FY17 and 12.2% in H1FY16. But, if you keep in mind that the full FY18 budget growth target was 15.3%, the growth in H1 looks less impressive, more so when you consider the numbers put out on the suspicious deposits being tracked. A total of 18 lakh persons who made cash deposits that did not match their income profiles was talked of by the taxman at one point; another figure put the amount of suspicious deposits at `2.8 lakh crore, though it was always clear all of this was not black money. Investigations of this nature take their time, and it is possible the data mining by the tax authorities will give them enough information to collect taxes from tax-evaders. But, till then, it does look as if we could be staring at large tax shortages at the end of the year. With shortages in other revenues such as those in telecom, and the growth slowdown likely to lower nominal GDP, the deficit will almost certainly take a hit. My take ---- many firms had to take GST registeration as their past years' revenue was above threshholds such as 20 lakhs, 75 lakhs etc. But now they are not even filing returns. And there are lakhs of them --- 14 lakhs out of 60 lakhs i.e. almost 18% to 20% !!! Some may file returns late. But many will simply end the business. So their business will get taken over by large firms. But total will shrink, though on-book GDP will rise. पिछले सारे रिकॉर्ड को तोड़ते हुए इस बार धनतेरस पर लखनऊ के लोगों ने करीब 18 अरब की खरीदारी की. रियल एस्टेट को छोड़ दिया जाए तो जीएसटी और नोटबंदी का असर किसी भी कारोबार पर देखने को नहीं मिला और पिछले सारे रिकॉर्ड ध्वस्त हो गए. जानकारी के मुताबिक सर्राफा बाजार में ब्रांडेड, अनब्रांडेड और बैंक से सोना, चांदी और डायमंड को मिलकर लगभग 255 करोड़ रुपए का कारोबार हुआ. इसमें 70 लाख, 45.5 लाख और 27.5 लाख रुपए की कीमत के डायमंड हार भी शामिल हैं. ऑटो सेक्टर में भी उम्मीद से कहीं ज्यादा कारोबार देखने को मिला. शहर में लगभग 11 हजार दोपहिया और 4500 कारों की बिक्री हुई, जिसमें 1.70 करोड़ की 5 रेंजरोवर, 1.21 करोड़ की तीन बीएमडब्लू, 80 लाख की 8 जगुआर, 22 मर्सिडीज, 40 स्कोडा, 2400 मारुती व 1500 हुंडई कारें शामिल हैं. इलेक्ट्रॉनिक्स प्रोडक्ट्स की भी जमकर खरीदारी हुई. ग्राहकों ने 115 करोड़ से ज्यादा के इलेक्ट्रॉनिक प्रोदुस्क्ट्स खरीदे. एलईडी, गीजर और वाशिंग मशीन खरीदने की होड़ मची रही. इलेक्ट्रॉनिक बाजार में करीब 15 करोड़ के मोबाइल भी बिक गए. ऑफ सीजन डिस्काउंट वाले फ्रिज, एसी भी लोगों ने खरीदे. धनतेरस से पहले व्यापारियों को भी ऐसे कारोबार की उम्मीद नहीं थी. Breaking past record, this time, people of Lucknow bought about 18 billion Dhanteras. Leaving real estate, the impact of GST and the ban on filing failed on any business and the previous records were demolished. (1) Say a software maker's revenue is Rs 1.65 lakh per month i.e. just below Rs 20 lakh per year. Say he decided to remain as unregistered. Now say in on 1-oct-2017, he sent some software worth say Rs 50000 to someone outside India by email. Now GST on software export = 0% anyway. So evasion = Rs 0. And say he got cheque in his own name and deposited that in his own savings account. And say he shows all on books. Say GST officers catch his "crime" in april-2018. Now software has GST rate of 18% . (2) Say a trader's revenue is Rs 1.65 lakh per month i.e. just below Rs 20 lakh per year. Say he decided to remain as unregistered. Now say in on 1-oct-2017, he sent goods worth say Rs 50000 to someone outside state by courier. And say he shows all on books. Say GST officers catch his crime in april-2018. Say goods he is selling have GST rate of 18% as most goods do. So if that unregistered delear, whether deliberately or accidentalty, sells Rs 50000 export or even Re 1 export, then a HUGE GST and penalty will apply on ALL his local software sales even if all was below Rs 20 lakhs !! Many small software makers take contract from internet and thus they have export earnings. They will get royally shafted in april-2018, when GST officers review all dollar deposits across all banks. (3) Say a trader's revenue is Rs 6.20 lakh per month i.e. just below Rs 75 lakh per year. Say he decided to remain as composite. Now say in on 1-oct-2017, he sent goods worth say Rs 50000 to someone outside state by courier. And say he shows all on books. Say GST officers catch his "crime" in april-2018. Say goods he is selling have GST rate of 18% as most goods do. So if that composite delear, whether deliberately or accidentalty, sells Rs 50000 interstate or even Re 1 interstae, then a HUGE GST and penalty will apply on ALL his local sales even if all was below Rs 75 lakhs !! (5) Say a cow owner is selling milk of Rs 25 lakhs a year and ghee of Rs 1 lakh per year. Milk is 0% GST and ghee is 5% GST. But total exceeds Rs 20 lakhs. So he needs registration - composite or regular. And file 37 returns a year (now 10 returns a year). If he doesnt, then when caught after a year, he will have to pay Rs 5000 on sale of ghee and pay Rs 36000 or more for not filing returns !!! In income tax and wealth tax, penalties are ONLY proportional to taxes evaded. And return filing is once a year. eg I dont pay quarterly taxes and pay taxes only at year end. So whats the penatlty? 18% interest on TAXES due each quarter, not some huge sum on whole gross income. All in all, it clear that purpose of GST is NOT to collect taxes, but to crush small / medium manufacturers , traders etc. There are so many points where they will make mistake, and each mistake will cost arm and leg. Suffices to say ---- the goal of GST is NOT to collect taxes but to crush small / medium business and traders so that large can grow by taking over their businesses. If goal was to collect taxes, then leaders would have FIRST taxed land and wealth, rather than chasing each and every sale. MehtaRahulC, please open a thread of your own for all your personal grievances. Do not pollute this thread or forum. Also, do not "Post Reply" to a thread and hijack it. Please continue with your posts. I find them highly informative and help explain what is going on. the start of RM fan club! Lord please not another love fest between the two!! Like it or not GST is the law of the land and it will only be tweaked and not removed. if anything the discussion should be how to improve it. Not a whine fest people. So vote Rahul Gandhi and go back to pre demonitisation days!! Don't want to pay taxes you deserve to have latrine water and pot holes on your roads!! Pathetic! 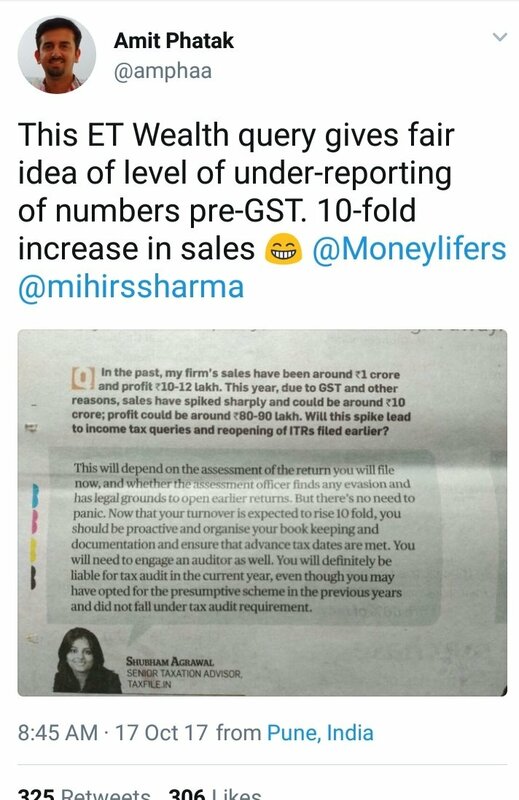 Mods - can we please have a thread for Rahul Mehta ji's musings all his fans could go there. In case you haven't noticed, he did open this thread! Beside, there is no harm in discussing the shortcoming of GST and how it can be improved. GST does need a whole lot of improvements before it becomes a good law. That may well be the unintended consequences of GST implementation and prove disastrous for India as overwhelming majority of Indians find employment in this segment of the economy. The shortcomings of GST needs to be ironed out quickly. I could not find RM's original post, so quoting yours. I agree with his diagnosis that GST objective was also to crush small business, because corporates have always wined and dined with bureaucrats and senior IAS level people in Finance Min. They are on first-name calling terms with each other and bump into each other at multiple fora, like assocham/CII meetings, IHC, IIC, Gymkhana or golf clubs, Corporate-govt interface, one-to-one meetings etc. It is the small guy who is unable to get access to ministers and senior-bureacrats to make their issues heard. It is the common man who is unable to arrange such one-to-one meetings with ministers because they lack the influence or money power to do so. So when crafting laws and drafting new bills, it is always big corporates whose concerns are heard and not the small guy. When it comes to election funding also the corporates have bigger heft because of their ability to make donations running into multiples of thousand crores unlike the small businessman, so politician and bureaucrat are always sensitive to big corporates and that is how most policies that start off with good intent are subverted. I initially hoped Modi was not a corporatist, because each and every one of our past PMs and FMs were out-and-out unashamed corporatists. But alas this one too seems no different. So my take on affairs is that the 'industry big wigs & corporates' used the guise of GST to crush SME sector by arranging for disproportionate taxation of 28% on many different sectors in blanket manner even though even a child can tell it is counterproductive WRT compliance. Many of startegic sectors manned by the big corporates come under 18% while small boutique manufacturers get hit under 28%. Voila big corporates are all good boys and small ones are all chors. GSTN lagging also helps big corporates because they have an army of accountants, CAs, and big 4 support backend. What do the small guys have, just 1 or 2 accountants. This thread is becoming unhinged to say the least. As per GST law, if a farmer or anyone of state-A wants to sell farm goods to state-B himself, then he has to first get regular registration (18% waalaa and not composite). Even if all products he is selling are 0% GST. And if all his products are 0% taxed, GST he has to pay will be Rs 0, but he will need to file 10 returns a year (37 returns a year as per previous law) and keep all books of all 0% goods he sells as well. So GST kills interstate trading oppurtunities of the farmer as well as small village traders. And lets see what more happens when eWayBill system comes. . I could not find RM's original post, so quoting yours. I agree with his diagnosis that GST objective was also to crush small business, because corporates have always wined and dined with bureaucrats and senior IAS level people in Finance Min. ... I initially hoped Modi was not a corporatist, because each and every one of our past PMs and FMs were out-and-out unashamed corporatists. But alas this one too seems no different. I agree with all you said, but I would say that along with making such charges on leaders, imo, we should point out EXACT clauses in GST laws and other laws which are giving undue benefits to large over small. eg Central GST Act clause 16.2.c , which defacto says that "if seller doesnt pay GST amount collected from buyer, then buyer, if he is registered non-composite dealer, Govt will collect GST amount from buyer once again" !!! And also explain alternatives such as Wealth tax which dont do damage to any productive -- be large or small. Only when a less bad alternative is put, imo, , there is a case against motives of leaders --- that why leaders deliberately chose worse alternative over less bad. Resturant's costs are staff salaries, rent, vegetables / grains , masala, some kaaju / kismish, electricity, furniture (which they already have) etc. Except masala / kaaju / kishmish, and possibly rent, there is NO GST paid on other items. So input credit that a resturant can claim isnt much except rent. Earlier too, resturants used to charge VAT and service tax on menu price, which was coming as imo 8%. VAT rate varied from state to state, and some states had law different rate if bill amount is below Rs 100 and above Rs 100 !! And service tax was 15% but on 10% of bill amount !! i.e. only 10% of bill amount was considered as "service" !! Now they charge GST. So effective increase in ac resturant is imo 10%, and not 18%. McDonand now has "what is you see is what you pay" menu !! The prices shown on display board includes ALL taxes / charges etc. I didnt check the bill details, but money I paid was exactly same as display prices. GoI can print law that makes is compulsory for all restaurants to show FINAL prices on menu. Since Gujarat is mostly medium level traders (business) economy., let's see what happens in the assembly elections in Gujarat. The Gujarat elections will be referendum on GST. so wait and watch! Is service tax for Mauritius company only 10%? 2. However, such fees for technical services may also be taxed in the Contracting State in which they arise, and according to the laws of that State, but if the beneficial owner of the fees for technical services is a resident of the other Contracting State the tax so charged shall not exceed 10 per cent of the gross amount of the fees for technical services. Now WTH does this mean? GoI has used such complex sentence construction ("contracting state", "other contracting state", "that state", "other state") that even after reading 10 times, I am unable to make myself 100% sure. And GoI as since 1950 didnt give hindi translation and translation in Indian languages !! And god knows how judges will interpret this clause when cases on this arise. My understanding is that if a company residing in Mauritius gives "technical services" to any company in India, then service tax will be 10% and not 18%. If that is the case, then many Indian companies may prefer to take service from Mauritius companies !!! Not only loss of business to Indian companies, but also a loss of forex to India !!! So , again, I am asking --- whats the meaning of these clauses? Do these clauses mean that service tax on services provides by Mauritius company in India will be only 10% and NOT 18%? Because blind support for Modi is going down? ^ No because posters like you seem to have an axe to grind. According to a latest survey by India-Today/Axis, BJP is headed for a comfortable win in Gujarat and HP, GST will not be a factor. In Gujarat majority of the people responded negative on GST implementation, but apparently that will have no bearing on the outcome of the election, Modi being a Gujarati PM is a bigger factor. And people like you don't? Now swiggy is criminal, ONLY if Swiggy is NOT depositing Rs 5.50 GST. And GSTN provides no way to know !! For more, pls ask a CA. But it has become customary on this forum to abuse businessmen and manufacturers, particularly small / medium ones, as crooks, theirves taxchor etc. And details can go to hell. You bring up a good point. People are quick to blame businesses and it is hard to run an honest business in India. Some people suggested that GST should be collected on milk and meat as only vegetables are necessary for human consumption. It’s crazy. GST is a good idea for expanding the tax base, but there are too many slabs and categories. Some really nutty stuff. Nuclear fuel has a 5% GST. Never mind the primary purchasers are research, nuclear medicine and the govt. itself. Some milk products have GST, but not milk. The argument is if it is not branded then no GST. Why not just make all dairy tax free? It’s all confusing. Items like fuel, alcohol and tobacco are not on GST yet, and if they are then revenue will fall as these items are heavily taxed beyond GST rates of 28%. I will wait until end of 2018 to see how GST pans out, I hope it does, but I remain skeptical. Right now it appears a bad tax system was replaced by a marginally better one.